1. Trapholt Art Museum (Trapholt Kunstmuseum) is an exceptional museum located on the north side of Kolding Fjord. Trapholt Museum opened in 1988, and is located in a beautiful park, with a spectacular view over Kolding Fjord. The Trapholt Museum is regarded as one of the finest tourist attractions in Kolding, and the museum is considered to be one of the best museums in Denmark devoted to Danish Modern Furniture Design. The Museum has countless furniture design by famous Danish Designers. Trapholt Museum also has a large collection of Danish Arts and Craft from the 19th century. The grounds of the Museum have a collection of Modern Danish Visual Art and sculptures. Tourists with an interest in Danish design should certainly not miss the opportunity to visit Trapholt. The Museum also holds temporary art and design exhibitions. The Café Trapholt offers visitors a great meal in beautiful surroundings with a view over Kolding Fjord. 3. The Castle Lake (Slotssøen) is a small lake on the grounds of Koldinghus castle and it is a very pleasant area to take a stroll or to relax and enjoy a pleasant day. The lake side of Koldinghus also allows for some spectacular picture taking of the castle. The Queen of Denmark is the only person, with permission to row on the lake. The rowing boat on the lake belongs to the Queen of Denmark. 4. Kolding City Park (Byparken) is more popular with the locals than with tourists. Byparken is located North-East of the Castle Lake (Slotssøen) you’ll find this large play park for kids. The park has slides, swings, moon cars, miniature golf, a lake with rowing boats and pedal boats and much more. Byparken is operated by the city of Kolding therefor entry to the park is free. You can also borrow life jackets for the kids free of charge. Many families opt to bring their own food which can be cooked on barbecues which are set up for public use. Alternately, you can buy food at the café. 5. Castle Swimming Hall (Slotssøbadet) is a huge aquatic park located on Hospitalsgade 16, right by the Castle Lake (Slotssøen). The aquatic park can be great place to bring children on a visit to Kolding, Denmark. The water park has everything the heart desires for small and big kids. 6. Saint Nikolai Church (Sankt Nikolai Kirke) is the largest church in Kolding. Visitors to Kolding can’t help but notice Sankt Nikolai Kirke which dominates the skyline of Kolding. 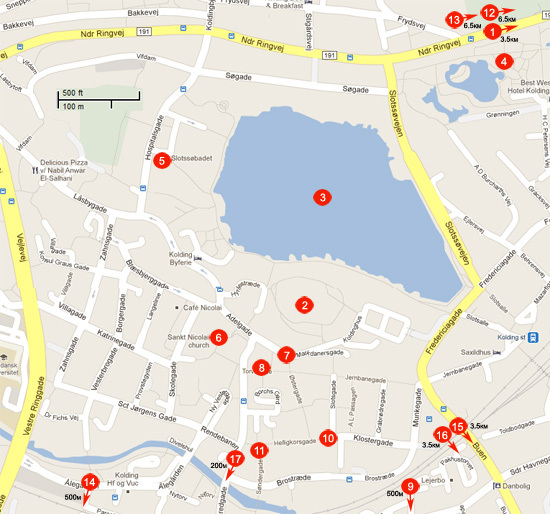 The Church is located on Nicolaiplads 3 in town centre. There has been a church on this location since the 14th century. Sadly, very little remains of the original church. The church which stands today was almost completely rebuilt in 1885 by Laurits Albert Winstrup (1815-89). Sankt Nikolai Kirke is still worth a visit for tourists if for no other reason than to see the interior of one of the largest churches in Denmark. The Church does have some stained glass windows which are considered to be some of the most beautiful in Denmark. 7. City Hall (Rådhuset) is located in a small, quaint city square is the very picturesque Kolding City Hall building. There has been a city hall located here since the beginning of the 16th century. It has been rebuilt and modernised several times over the years. Architect Laurits Albert Winstrup designed the new city hall in Romanesque style in 1873, but it was later rebuilt and redesigned by architect Ernst Petersen in 1924. There is a painting of Otto Bache in the foyer by the front stairs. The sculpture in front of the city hall is called Bacchusbarn and was designed by sculpture Anne-Marie Carl Nielsen in 1898. 8. Borchs Farm (Borchs Gård) is located next to Kolding’s City Hall (Rådhuset). Borchs Farm is one of the most impressive timber-framed buildings in the region. This unique timber-framed building dates from 1595. Borchs Gård was originally built as a Pharmacy for the town of Kolding.